The Nominating Committee shall consist of five (5) Board members including the Chairperson of the Board and the Council President. The Committee shall be named at least thirty (30) days in advance of an election. The Committee shall send the roster of nominees and their qualifications to the President in writing at least fifteen (15) days in advance of each election. The Nominating Committee shall be dissolved as soon as the election is over and all of the newly elected officers are announced. The President shall name the Planning Committee, which consists of the Senior Vice President (Chairperson), three additional Board members, and the Secretary General. The Committee shall consider long- and short-range plans for the Council. The President shall name the Publication Committee chaired by the Editor-in-Chief of the International Journal of Korean Studies (IJKS). The Publication Committee may negotiate with appropriate publishers for the publication of conference proceedings or other materials. Academic Committees shall be named by the President in major academic fields as deemed necessary to promote academic goals and objectives of the Council. Academic Committees shall advise the President in finalizing annual conference plans. 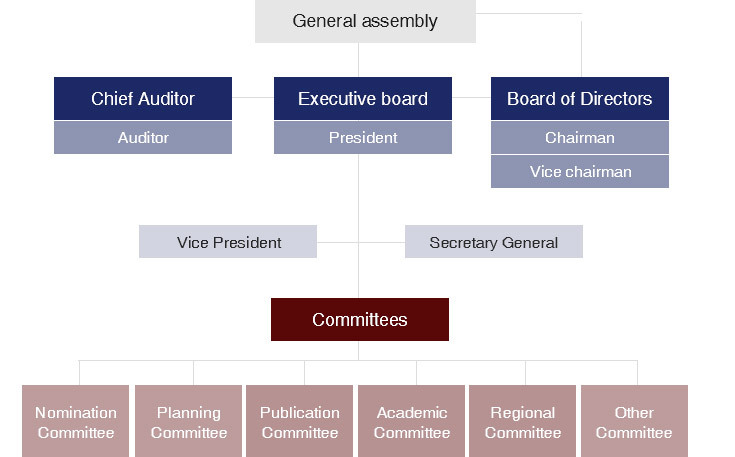 Regional Committees may be designated by the President in the major regions of the United States and the world. Ad Hoc Committees may be created by the President as needed.